I attend Bible Study class almost every Sunday. The teacher/facilitator is a very insightful person, committed to serving the Lord. Yesterday, as she was speaking, she made a statement so obvious, yet so profound that I simply had to write it down. What do we do when we need advice? If we ask for it, do we really want to hear the truth? "We go to like-minded people to get confirmation so we can stay stuck where we are." If we really don’t want to quit our job and go back to college, do we intentionally go to friends for advice who we know would probably counsel us to remain with our current employer? If we are angry with someone, do we gravitate to others who are angry themselves? 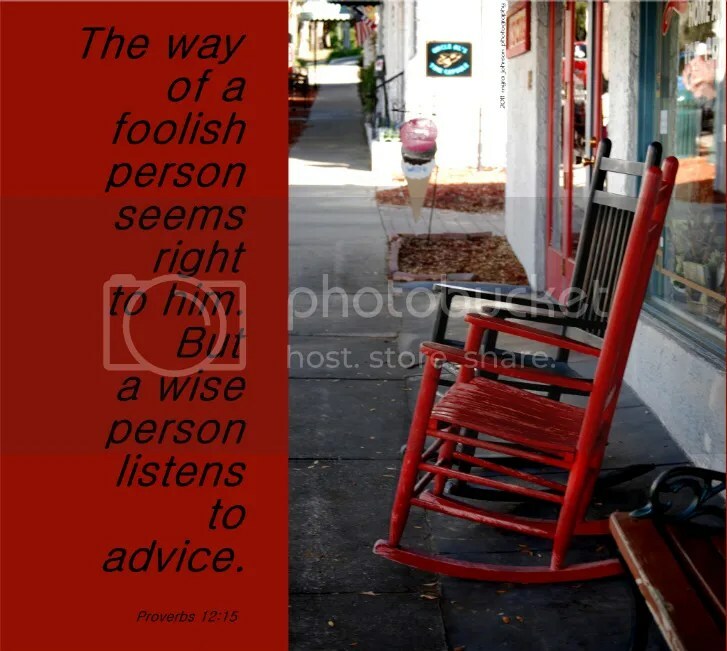 "The way of a foolish person seems right to him. But a wise person listens to advice." We should seek counsel from those that are known for their wise, godly counsel, even if we know that the advice might not be what we want to hear. Not far from the church where the Bible study class meets, a small shop has a couple of rocking chairs on the sidewalk in front. Their presence invites and encourages those nearby to stop and rest awhile. Hear a fellow Christian’s viewpoint…. The rewards of such a time could be eternally profitable. On my way to church this morning, I saw him. Sitting alone in the barren tree, high among the lifeless branches. With the calm lake waters beyond him, he kept a solitary watch in the early morning air. Was he simply searching for a good vantage point from which to spot an unsuspecting fish? Was he contemplating important things—perhaps nest building or migration? Whatever the case, I will certainly never know the answer. For me, personally, the scene of the single bird gave just a hint of the forlorn–somewhat distant and detached from better days. 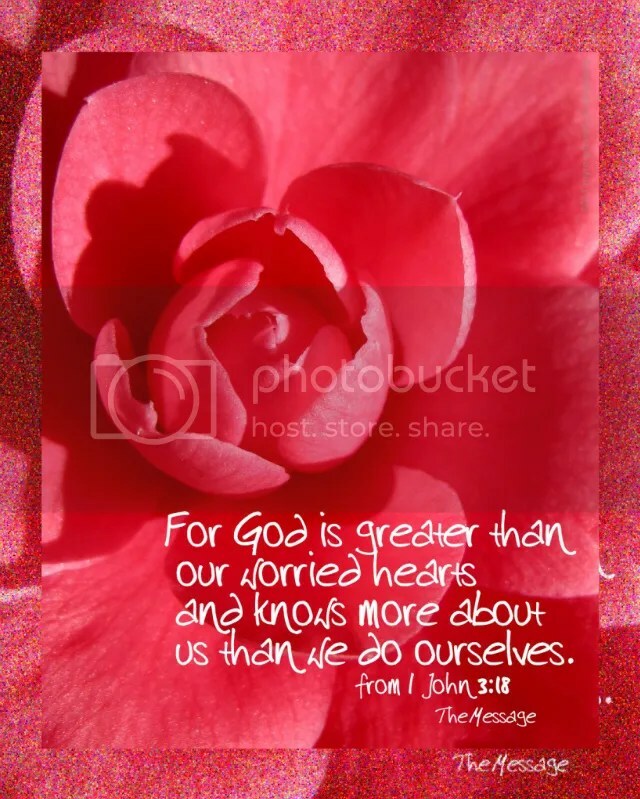 When we are depressed or physically ill, God understands. We can go to God in the midst of our troubles. Do not hide Your face from me in my day of trouble. answer me quickly when I call. At times, don’t we sit alone in our barrenness, high up, far away from others? Like a solitary bird, we retreat to an empty branch to sort out our feelings. If we go to the top of the tree, God is there. 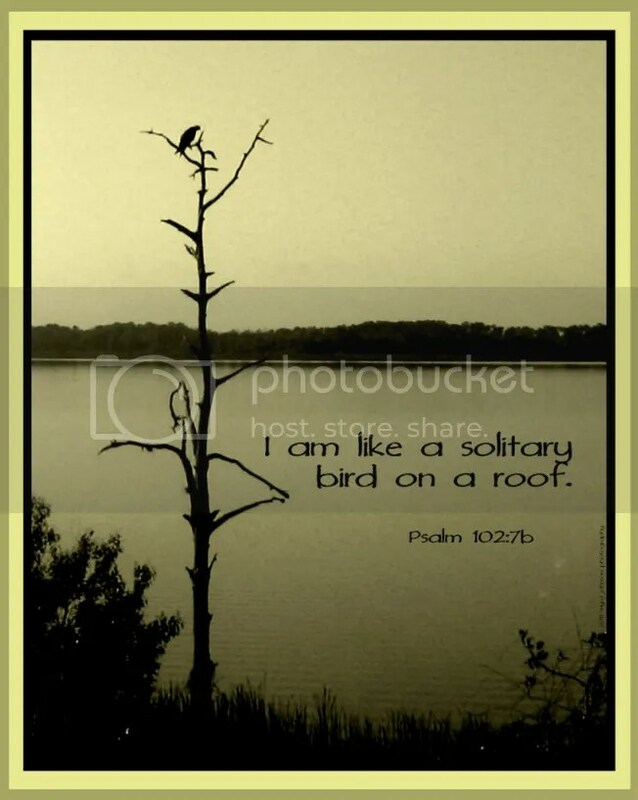 If we choose to perch on the lowest branch, God can be found there, as well. 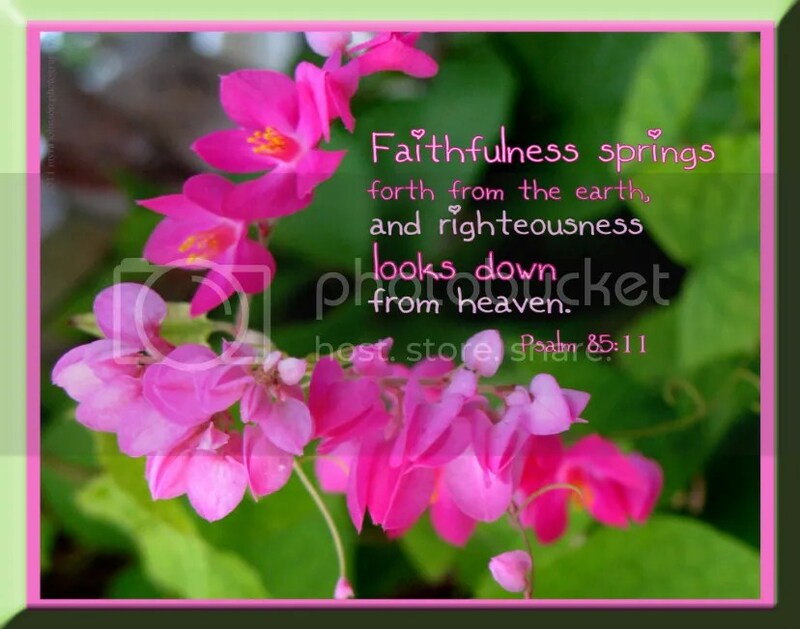 Whatever our condition, God is faithful. Last weekend, I went with a group of people to visit some farm land. The owner was allowing people to do gleaning there, as well as to plant in order to provide food in the future for those who were lacking. The guide held up a small plant as he spoke to the group. Many hands were involved in the entire process. Plants were placed into the ground. The sun was shining warmly. The gleaning process involves a farmer who allows others to take any food left behind in the fields after the main harvesting is completed. The food that is obtained is then taken to a certain area and given to people who are in need of it—free of charge. It is a ministry of love and of concern for those who are hungry. 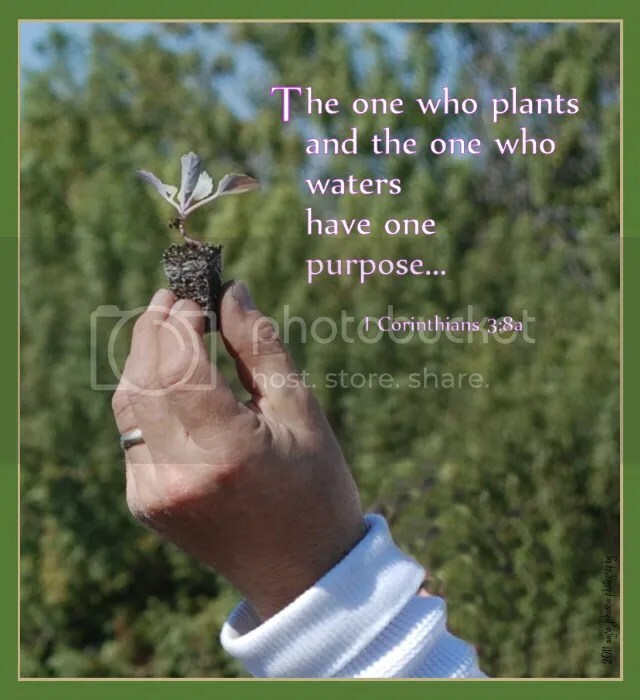 Applying these thoughts to the activities of last weekend, several people had a hand in showing God’s love to the poor and hungry; some planted, others watered. Some harvested. 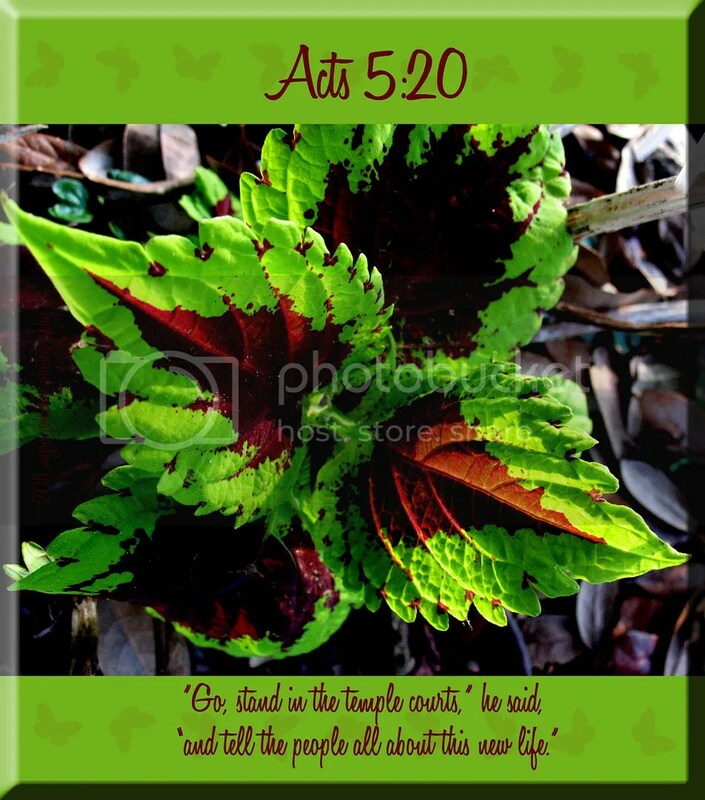 It is God who makes the plants grow. Those who were at the farm that day were co-workers in God’s service, having one purpose. Have you planted anything lately? The radio announcer mentioned a high temperature of 86 degrees today. The Azaelia bushes are blooming pink outside my kitchen window. Clover is sprouting up thick on the lawns disguising the soil beneath it with a thick carpet of vibrant green. When I am stopped in traffic, I often look about to check out my surroundings. While sitting still among several vehicles on the highway today, a tree filled with yellow blooms graced the roadside to my right. How bright it was! Luxurious color radiating from the dark branches shouted in silence against the blue backdrop of the afternoon sky. Soon, the traffic was moving, and I along with it. Spring is a wondrous time of year. If the whole world is a singing choir of life, then it is God that makes it so. As the new season approaches, let it remind you of new things–new possiblities, new adventures, and new vision. God is making things new again! I was going with a group to a Christian conference in a city about an hour’s drive away. Sitting in the van waiting, I happened to notice a most beautiful sight. 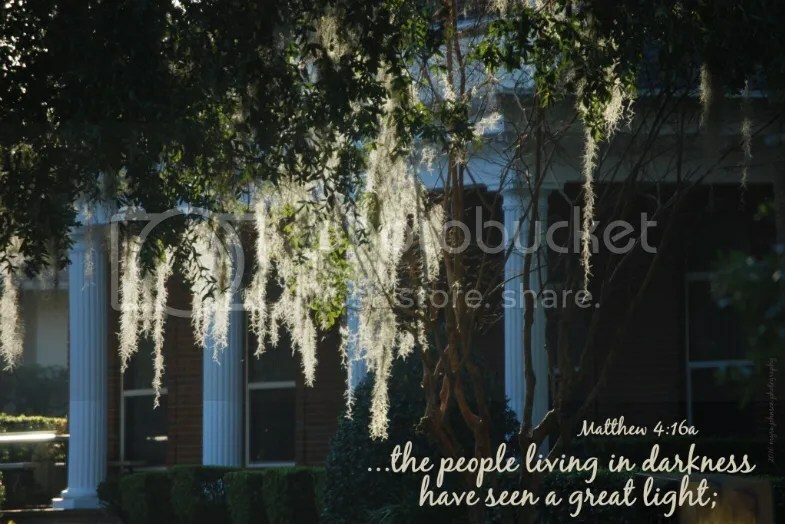 Across the street, the early morning sun was brightly shining through the Spanish moss suspended from the trees. The light transformed the moss into drapes of glowing, lacey curls. The area immediately around the moss seemed relatively unaffected in the shadows, yet the light had come and was coming still as the seconds passed and the sun grew taller in the sky. For the people of the world, a great light has dawned. Jesus has come to save us from our sin. I grew up in a farming community where the land was wide and flat. Cotton and soybeans flourished in the area. Small wisps of cotton would fly through the air effortlessly during the harvesting season. Driving out away from neighborhoods, you could see for many miles. To this day, I am attracted to different terrain— the beauty of hills and mountains. Places where I could stand and see further. Places that I could look up to. When I think of Heaven, I think "up," although I know that Heaven’s reality is so much broader than that concept. When I think of where God is, I have a sense that He is also above me, even though I know He is everywhere. 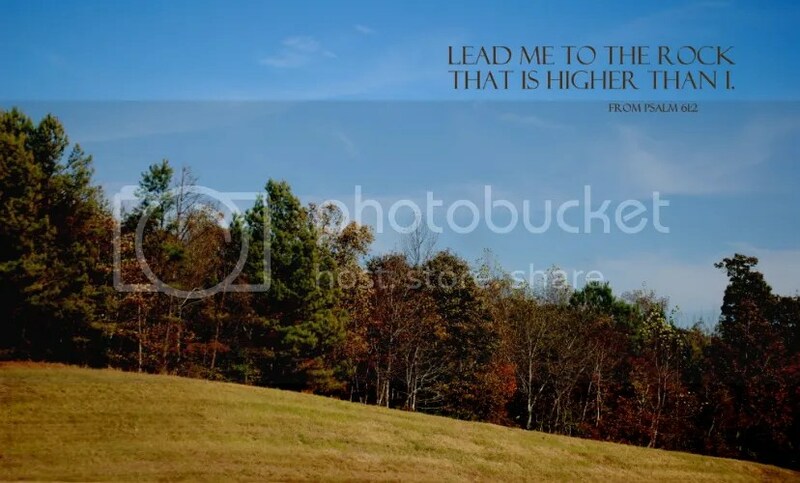 When I cry out to God, I sometimes look up. With God, I can stand and see further, comprehending in a way I couldn’t before. He is my refuge, through every difficulty. 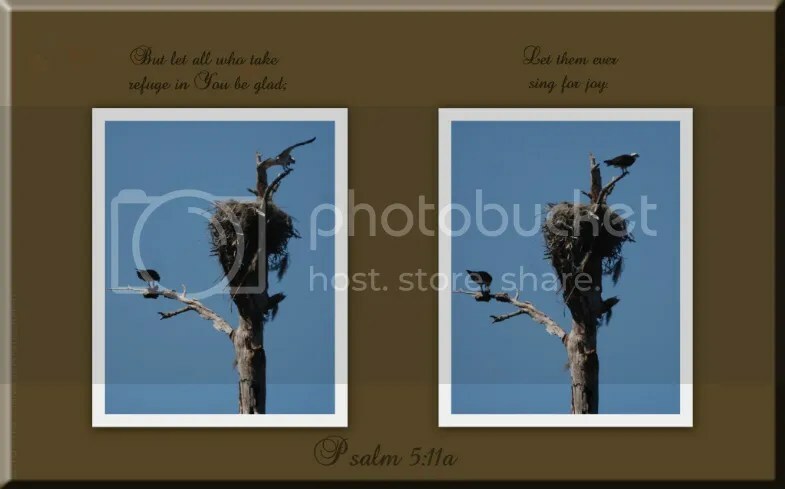 There is a large osprey nest down the road from my house. Driving past it recently, I checked to see if anyone was "home." To my delight, the answer was, "yes." As I photographed the osprey that was in view, another joined him. This one was bringing food for the little ones. I couldn’t see the young osprey babies, but I could certainly hear them. As soon as dinner was approaching, a chorus of excited bird talk began with impressive volume. They were singing for joy as their needs were soon to be met. It is God who meets our needs. When we see that He is providing for us, do we sing for joy? The car was in the shop, being repaired. Because the car was in the shop, I was getting a ride home from work with a friend. And because I was getting a ride home with a friend, I was sitting in the passenger side of her car. Because I was sitting in the passenger side of her car, I was free to notice the sky just above my right shoulder. And because I was free to notice the sky just above my right shoulder, I noticed it. Because I noticed it, I quickly got my camera out to photograph such a stunning scene. There had been a fire in the area and the dusky brown smoke was hovering and mingling with the clouds. The sun seemed to look a bit different, due to the filtering of its light through the smoke. What caught my absolute attention, though, happened to be two jet trails marking an X right through the center of the sun. Within moments the X had drifted past the center. I had witnessed a most remarkable occurrence. Even recognizing that the trails of white were left by planes, it was a wondrous sight to see. How would I have felt if some other, totally unexplainable, sight had been above me? 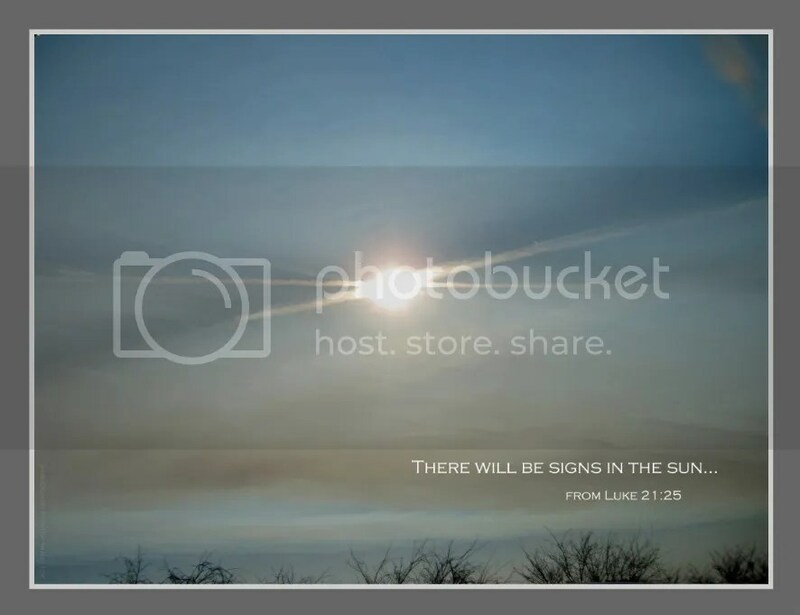 "There will be signs in the sun, moon, and stars. On earth, nations will be afraid and confused because of the roar and fury of the sea. People will be so afraid they will faint, wondering what is happening to the world, because the powers of the heavens will be shaken. Then people will see the Son of Man coming in a cloud with power and great glory. When these things begin to happen, look up and hold your heads high, because the time when God will free you is near!" One day, Jesus will return. If you were to look out your car window one afternoon and see a miraculous sign in the sky, would you be ready to meet Him? It’s my absolute favorite place to eat. 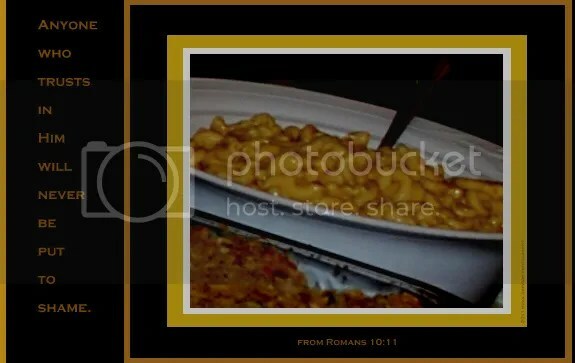 Located in a metropolitan area, the restaurant is warm and inviting. There seems to always be a very international clientele dining there when I visit. It is not unusual for me to hear a variety of spoken languages among the happy crowd of patrons serving themselves at the many booths taunting a particular food item. This well known restaurant prides itself on making everything from "scratch." Nothing is supposed to be "from a can." They have reason to brag—the fresh baked breads and vegetables, pasta dishes and luscious desserts are always delicious, every day, no matter what time of day. Just a few nights ago, I sat at a table located near the fresh, made from scratch, choice of soups. My mind wandered as I was noticing others who were eating in close proximaty to me. 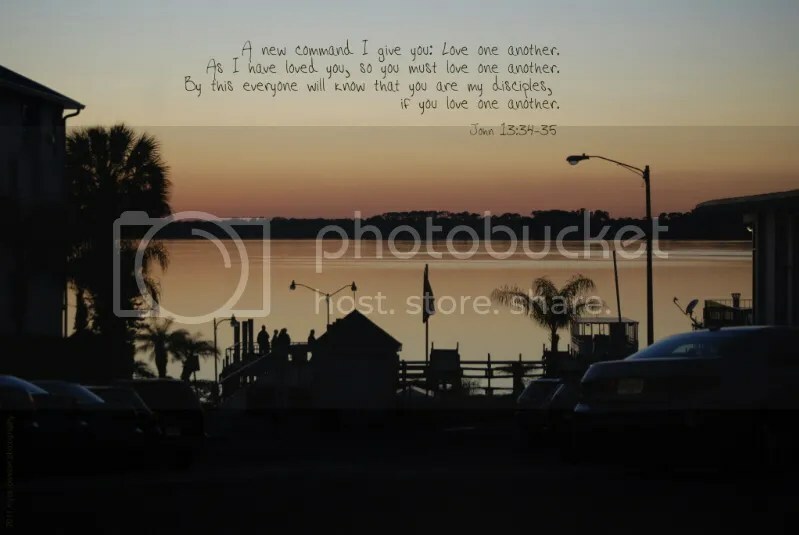 Being in a large city atmosphere with a decidedly rich diversity of culture, I found my thoughts focusing on how the people there were all very different, yet God loved us all just the same. In fact, He desires a personal relationship with each of us. It doesn’t really matter to God what language we speak. Nor is He concerned with our clothing style. If our hair is long or short, if we are young and vibrant or aging and slowing down our pace a bit, it matters little when it comes to the most important thing—knowing Him. As I sat there, I really looked at people. People talking to one another over their plates, discussing their lives. Each one with a story only God could fully know and understand. Each one in need of a Savior. Each one precious in His sight. Each one a neighbor, a friend, a co-worker. A mom, a dad, a son, a daughter. Why not share what God has done for you with someone you know today? Give them a telephone call, write a note or take them out to eat. If you choose the latter, I know the perfect restuarant…..
Today was a very special day for many people—Valentine’s Day. 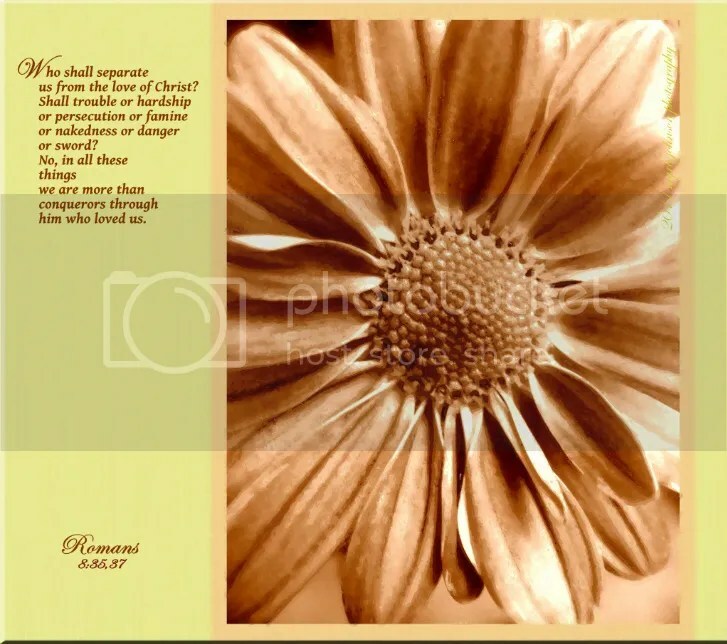 As we tried to show our love for others in a myriad of ways, did the love of God shine through to their hearts? Did those around us know that we were Jesus’ "disciples?" They should know we are Christians by the love that we have for one another. By this, everyone will know…. There’s a particular restaurant that I frequently visit. Located in an old downtown building on the second floor, it has the ambience of a yester-year city with outdoor seating as well as separate "living room" areas in which to dine or chat over coffee–all of this with vintage wood flooring. This afternoon, I was enjoying my coffee in one of the rooms for the first time. 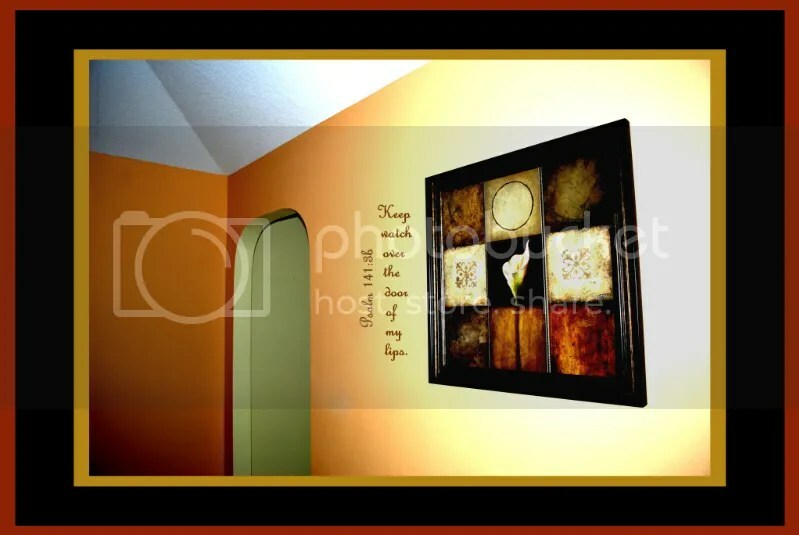 Cozy and inviting, a window with a white sill adorned the outer wall. The area was decorated with original paintings and a single vase of faux flowers. I wonder how many people have dined there over the decades since its construction? Of those that have, how many have been followers of Jesus? How many have not? Hour after hour, as customers walk in and walk out, they all share the same surroundings. The menus are the same, but the people are different. God loves each one, whether they acknowledge Him or not. For every person, His invitation for life eternal is given equally. My husband’s new glasses were ready to be picked up at the optometrist’s office. I decided to go along for the ride, though I didn’t go inside. Deep in thought, I stared blankly at the surroundings, only vaguely aware of movement or sound. At some point, I became cognizant of a bird in a tree not far from our vehicle. Walking toward it (was staying in the car really an option?) I began to take photos as he posed one way, then another. Each particular posture showed a different countenance—aloof one moment, attentive in another. Surely confident that his presence was camouflaged within the clutter of branches, he remained in the tree. It was I who chose to retreat, but only after several photographs had been securely recorded. Looking at the images later on my computer, I could more closely see his face–beak, eyes—even what looked like whiskers protrudeing from his head. Did he look expectant? Was he joyous just to be alive in this big world? 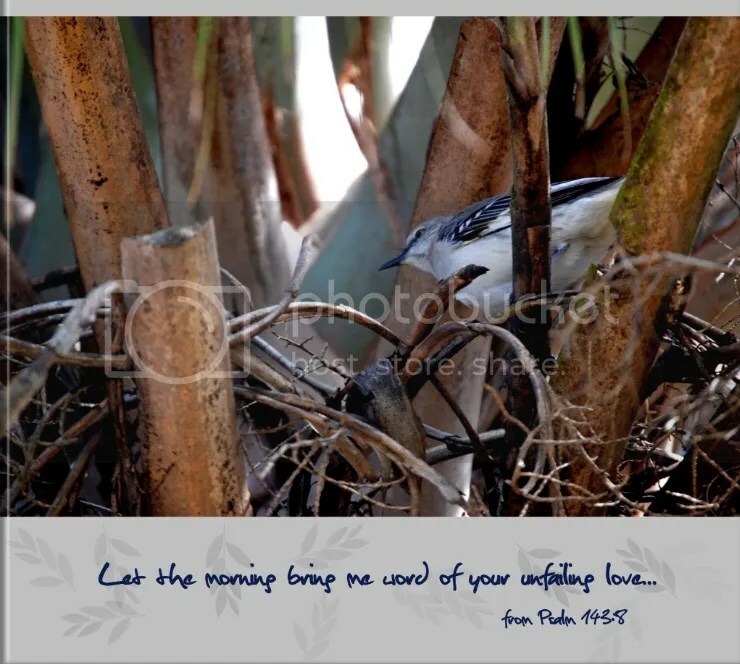 I should be as wide-eyed as my little bird friend was when it comes to being expectant of God. How will God show His love to me today? 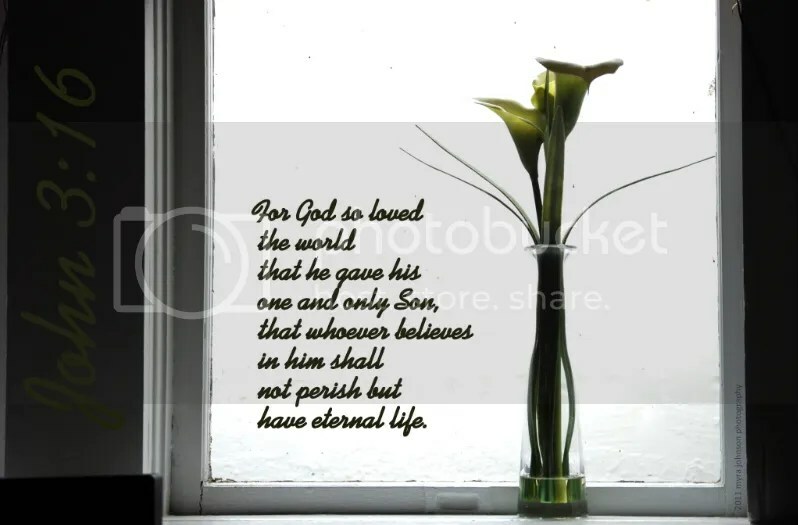 Since I have entrusted my life to Him, what way will He show me today? Whether I am happy or sad, I should expect that He will guide me in knowing Him better through every moment. His love will never fail. Exactly what is it that God can do? Is there any limit to His abilities? Is there a need that He cannot take care of? 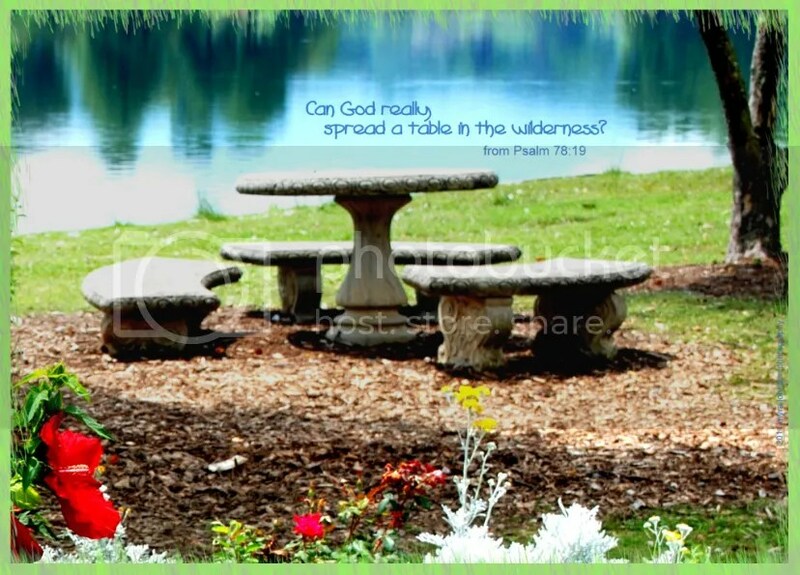 Whatever you are facing, know this—God can spread a table in the wilderness of your life. Can He provide the job? Can He guide you in making choices? Can He heal your broken heart? Can He bring joy out of sorrow? Let’s not forget what He has done for us in the past. He can supply our every need. It began with the main character achieving great status in his chosen sport. With a prideful and independent attitude, he was arrogant to others. Early on in the film, he had earned a chance at competing in a very prestigious event. A promotional agent telephoned him to offer congratulations. The agent also had some good news. Because of his outstanding achievement, the character was given complementary tickets to give to a small number of his closest friends. The agent needed their names. Dumbfounded, the celebrity stood silent. It was a sad and telling moment in the story. He had no names to give because he had no friends. No one with which to share a possible victory. No one with which to celebrate the achievement. And why was that? His attitude had pushed would-be friends away, leaving him alone. Though it was quite involved, the movie ended with a complete change of heart for this super star. Once arrogant, now humble. Once prideful, now grateful. Once without friends, now with true companions. 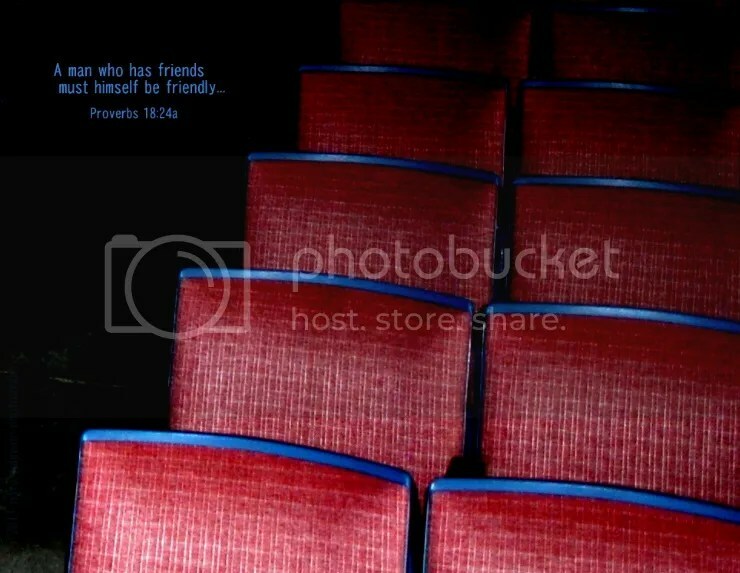 What if I had free tickets for ten friends to accompany me to an important event? What if I won a cruise for myself and ten others? What if a banquet was given in honor of a personal achievent I had reached? Would I have any friends to invite? I actually began to think of who that might be. Do I actually have ten friends who would thrill at sharing in my success? If I don’t, then why is that? If I am to have good friends, I should begin by being friendly to those around me. The light makes a difference. When the sunset was just tipping the tops of the trees, it was as though they completely changed colors. What was green before was now golden. What was shadowy before was now illumined. God’s light makes a difference. With His light in our lives, we completely change. Our lives are illumined with His light and His love. The God of gods, the Lord, speaks. The weather forecast for my area was for rain. If I am recalling correctly, it was about 80% chance of precipitation. I decided to check the radar on my computer. It was clear! Well, almost. There was a tiny, little edge of color to the west of the map. Such a small, fairly insignificant thing. Still, I wondered what might be "out there" headed my way. I decided to switch the radar view to "regional" and look many, many miles away. By getting the view comparable to looking down from much higher into space, I could see a much greater land area. There it was…. a HUGE line of possible thunderstorms and heavy rain looming to the west traveling toward my location. Once I had the information and had received instruction, I understood. I’m sure it didn’t take too long for the colored mass to float across the radar screen, soon to cover the spot where I was—the spot marked +. Are there times when we are given information by God, but we question it because we don’t see the full picture? We may only see just a small, seemingly insignificant, concern about a matter, even though God may be cautioning us. We ask, "Why, God? It seems so clear! 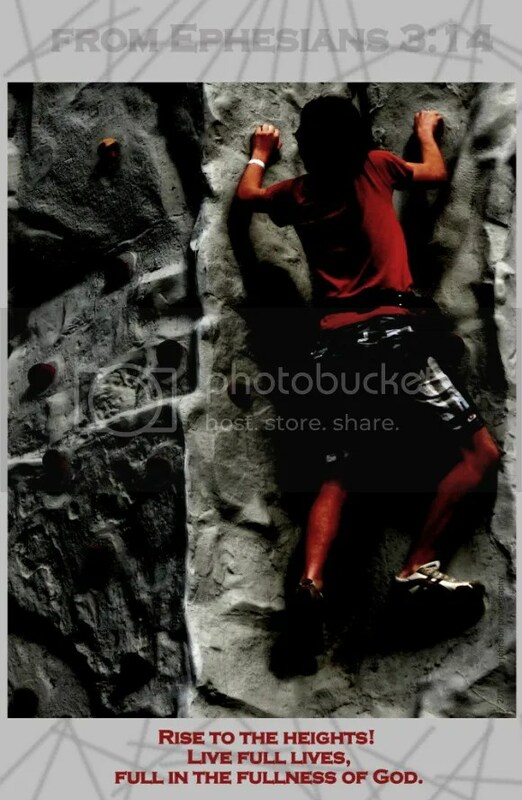 I don’t see any obstacles!" In zooming out to gain a better view and broader perspective, we might request prayer from others, pray more about the situation ourselves and seek to understand what lies beyond our present vantage point. Doing so, we may find the large and looming circumstances that warranted God’s prompting. Giving heed to His leading is most important. 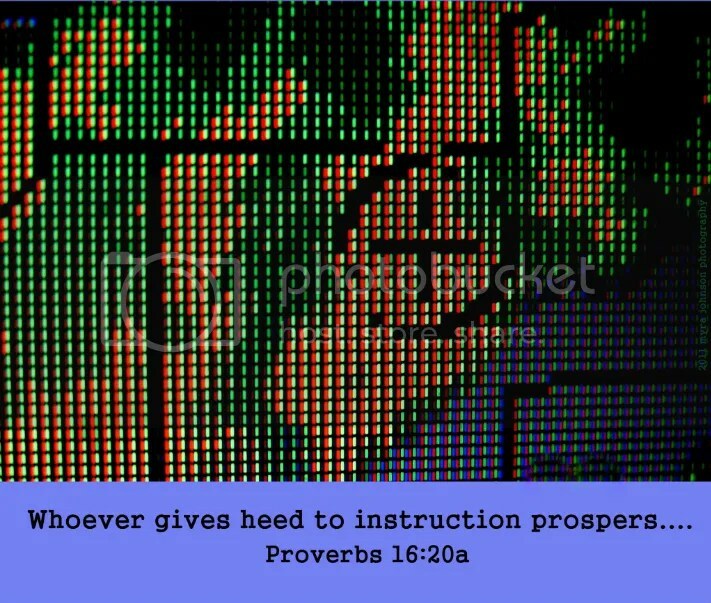 Proverbs 16:20 says, "Whoever gives heed to instruction prospers, and blessed is he who trusts in the LORD." 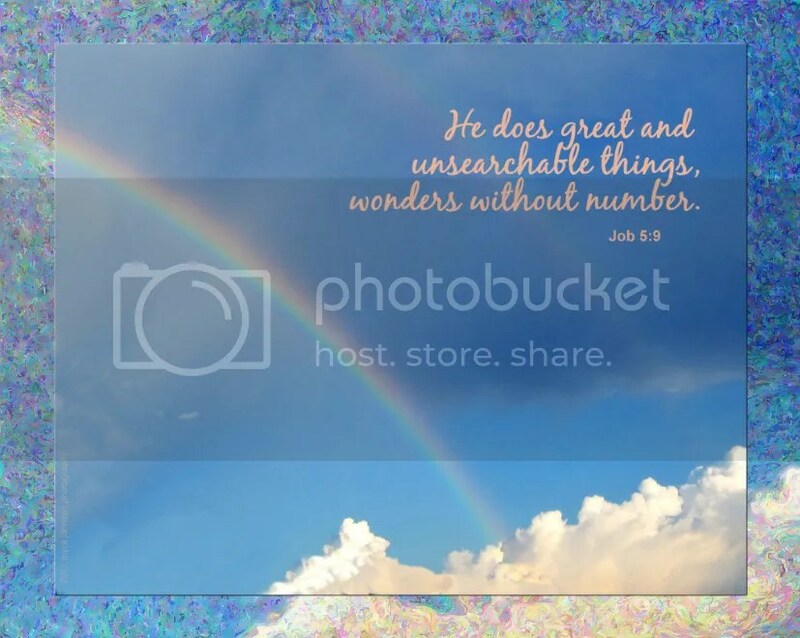 What great, unsearchable, marvelous and miraculous things has God shown you in your lifetime? You have a story all your own to share. Why not tell someone—- today? As I was driving into my neighborhood this morning, I saw a sign. It was advertising an estate sale. Walking into the home, there were several people working. I was greeted by someone who explained the current rate of sale for the items left. I was told that this was the third day of the sale. Walking through the rooms and looking at everything from bedspreads to kitchen utensils, I found my way to an enclosed sun porch. There were several tables with various items. I stopped to look at individually bagged jewelry items. Curious, I asked a couple of shoppers nearby if the owners of the home had died. It seems that the couple who had lived there had both become ill and had gone to live with family. Their belongings were being sold. Browsing further, I looked at hand made items, vases, knick-knacks and silk flowers. There was a soberness about my thoughts as I quietly perused items that had been important to the elderly couple. Keepsakes from journeys past, childhood memories in a china dish or glimpses of love in an anniversary gift—now were possibly being sold to anyone stopping by. Not finding much that I needed, I walked to my car with only two items—a bottle of cologne and a can of fragrance spray. I am glad that this husband and wife had family to care for them, yet the whole experience made me kind of….sad. While considering what was left behind, there may be very positive aspects that are unknown to me, however. The most important things in the lives of these people were not items that could be sold. Did they spend their lives serving God? Did they love others? Did they invest in the nurturing of their children? The answers to those questions I will never know. I do, however, know that at the close of life, we may only arrive in Heaven with ourselves. Worldly possessions must remain exactly that—in the world. 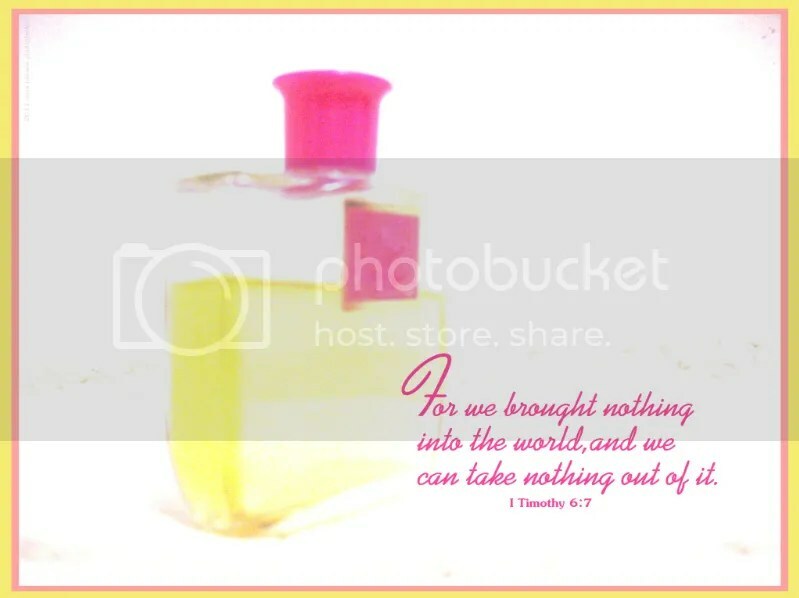 I Timothy 6:7 reads, "For we brought nothing into the world, and we can take nothing out of it." The most important things in my life cannot be sold. My relationship with all who know me. Remembering that truth is as simple as……. I really hadn’t expected it. The morning mist had appeared while I slept comfortably inside, unaware of its presence. Upon waking and finding it to be a particularly heavy fog, I ventured out to experience the surreal surroundings created by the atmosphere. Excited birds flittered on the ground. The sun’s rays were muted from their usual amber to a glowing white aura within the miniscule droplets suspended around me. Looking one direction, the trees in the orange grove stood silently in the calm. Turning yet another way, neighbor’s homes were partially draped from view, hinting at their true form. Because I have experienced it before, I knew it wouldn’t last. Fog becomes heated and disappears, leaving no lasting effect. When God forgives us of our sin—our faults, our mistakes, our poor attitudes, all that is displeasing to Him—He remembers it no more. 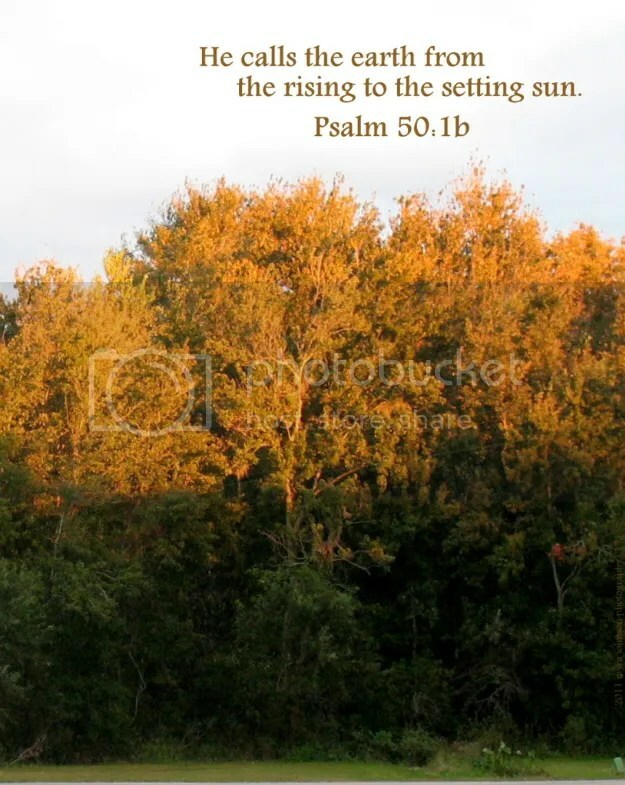 He sweeps away our offenses just as the morning fog is swept away by the heat of the sun. 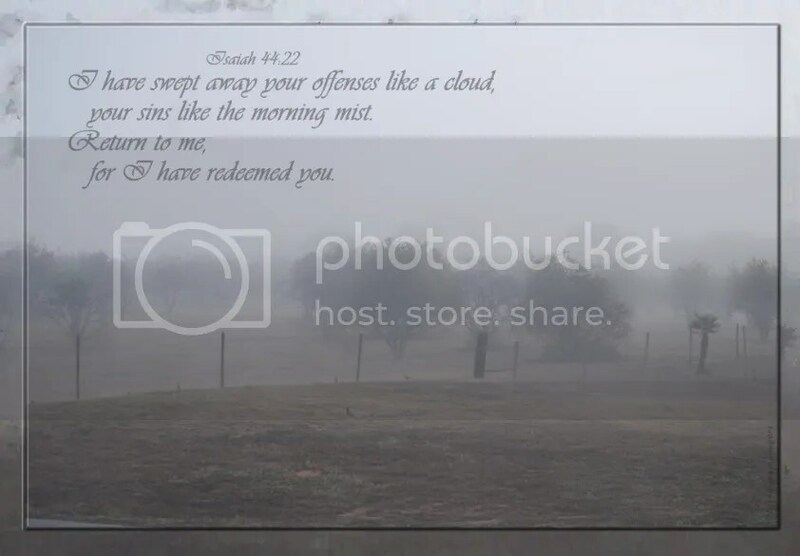 Just as the mist cannot be found, so our forgiven sin cannot be found to condemn us. We have such a loving God! Through the sacrifice of His Son, Jesus, He has redeemed us from our sin. Today, as I was reading a book about discerning God’s voice, the author quoted someone who said that they knew God was speaking to them when the same message came to them repeatedly in a short time. I highlighted those lines in the book, because that has happened to me several times. Last night, I opened my son’s Bible to read. There is a break in the binding, so that it can very easily and readily open to Psalm 19. As I picked up the Bible, I was reminded that I had just read a portion of Psalm 19–perhaps even the night before. I decided quickly that I would read it again and ponder its words. As I said, that was last night. Today, after highlighting the quote about repeated reminders of the same message, I read five more pages. On the fifth page, the author had a special stand alone paragraph of scripture in the middle of the page. 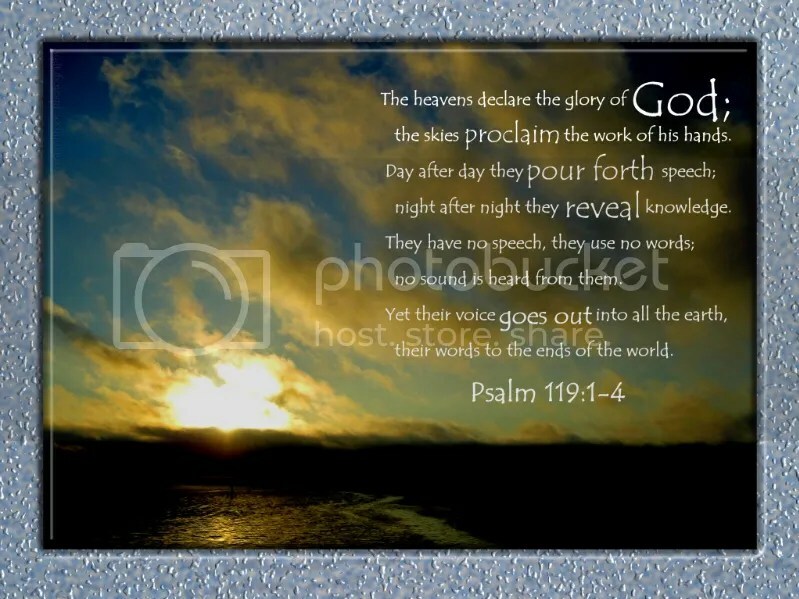 It was….Psalm 19:1-4! Realizing that God had placed this scripture before me at least three times recently, my heart was open to the meaning He would show me. Shortly afterwards, I sat down at the computer. An advertisement was on the right hand side of the page I was viewing. It was for an online study Bible. I clicked on the ad and found the website. What scripture would I like to study? If you guessed Psalm 19, you would be right. Very easily and plainly set before me was a resource telling me the original meanings of words within the passage and insight about how it had been written. I feel that God placed the advertisement there in order to give me greater insight on what He was presenting to me. Knowing that God wants me to focus on this scripture is exciting. What things will He show me? I am eager to know…..
How many times have I talked about love, but then, maybe only for a moment—the time it takes to say a few critical sentences—not really practiced it? I truly do want to practice real love. I want kindness to be a part of the fabric of my days, seeing others with understanding and compassion during major crises as well as in the normal, everyday functions of life. I want to be uplifting and encouraging, whether I am visiting in a hospital room or washing dishes at home. But how? If I am convinced at any time that I am not loved, not accepted and useless because of hurt feelings or assumed failures, the feeling of being worthy to reach out to another’s need diminishes. Think about it—does this happen to you, too? When I am really feeling "down" about myself, I am unlikely to send an encouraging email, pick up the phone to check on a friend or really seek to understand the needs of someone else. Being preoccupied robs me of awareness. Since God knows me completely and still loves me, this fact needs to be placed at the forefront of my life. Every day I am given can be one in which my words and actions bless someone else. With God’s strength, it is possible. Since God knows more about us than we do ourselves, shouldn’t we trust Him to lead us, moment by moment, word by word, in being who He wants us to be each and every day? In the climate that I live in, there are a variety of houses that are built. Many homes are constructed of concrete blocks. Driving down any of the main roads, it is plain to see that mobile homes are quite common, as well. Some houses are made with bricks and others boast vinyl siding. Houses made of wood can be seen in some of the older portions of the towns. The homes, of course, are only structures made to house the people who live within them. The people are separate from their homes. They can even change residences, if they choose to. I am certain that I have friends living in wide varieties of homes. If I visited another area of the world where shelters were constructed differently than I had previously known, I am sure that I would gain friends living there, as well. Our physical bodies may look very different from others—skin, hair, eyes—-but our bodies are really only our temporary housing on Earth. Who we really are inside is destined to change residence one day if we know Jesus. Our current "house" will be exchanged for a new one that will last forever. What will that house look like? It will not matter then, about appearance. 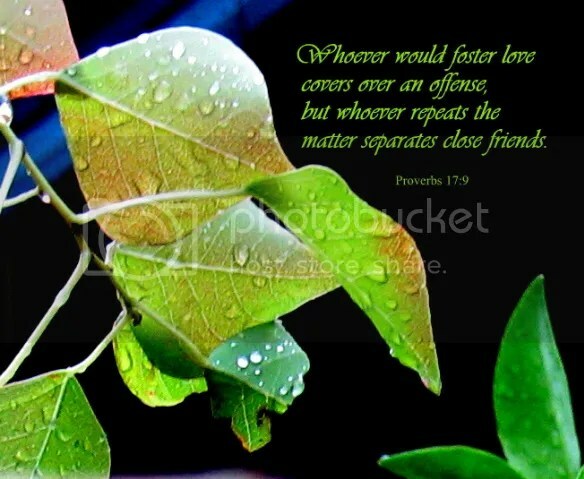 We will love each other as friends–as brothers and sisters in the body of Christ. Skin, hair, eyes or even stature will be counted as beautiful by all. 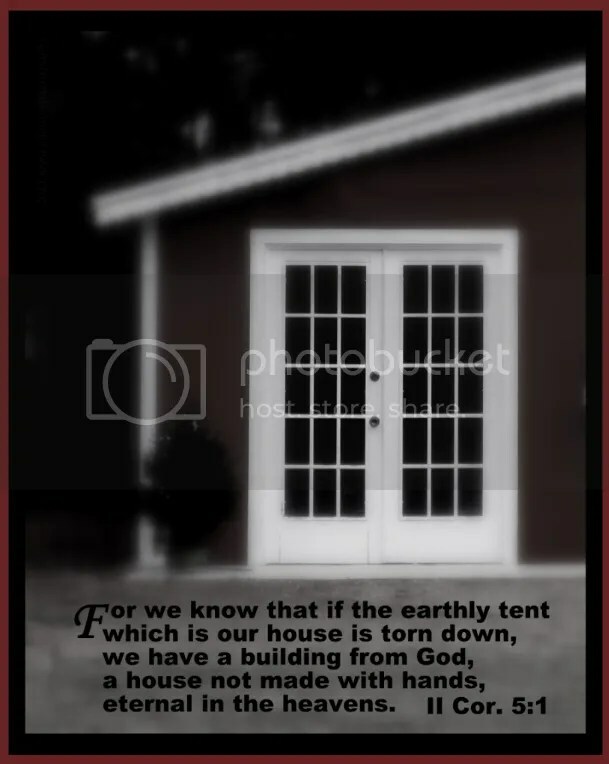 Whatever we may look like now in our temporary "houses," we are still precious to God. And if everyone we meet is precious to God, shouldn’t they be precious to us, as well?